Update: Zenfone 2 prices range from 12999 to 22999. I am not following the smart phone market closely. New models are being launched every week, some even need an invite for you to buy them. Different specs, different price ranges and features- there're just too many options and very difficult to keep track and stay updated, unless you're full time into it. Accidentally I landed an invite to attend Asus Zenfone 2 pre-launch event in Chennai. It wasn't a direct invite- I wasn't invited by Asus PR. But they left a message on Chennai Blogger's Club facebook page via Karthikeyan. Since the timing was doable and I decided to check it out. With little expectations and lots of curiosity, I entered the venue in Park Sheraton, Chennai. We were made to sign up to Asus ZenTalk, a forum for Asus customers and fans. 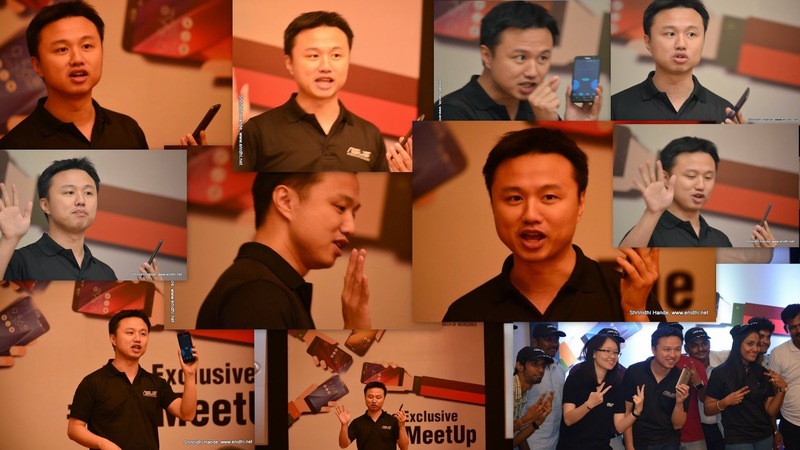 There were many other invitees- few bloggers (Met Mahesh, Satish and Sathya) and many existing zenfone customers/fans. This post shares my findings and observations at the Zenfone 2 pre-launch event. Asus Regional Head for South Asia, Peter Chang and his colleagues explained us some key features of the soon to be launched Zenfone 2. We were shown videos and testimonials. 2 Camera with Selfie Panorama feature- that ensures everyone are covered in the selfie.. A sample below- see how wide it is. (ignore the quality- camera output was projected on big screen which I clicked on my camera). Very useful feature to cover more n more people in the selfie shot. 4. Child mode- only some selective apps will work- prevents kids from making calls or sending msg or other unwanted stuffs while they are playing with the phone. 10 Asus used to pre-load the phone with lots of apps. Now they have reduced no of pre-loaded apps,as many customers didn't want an overload of apps. More apps can be downloaded as needed. Q1: Why Intel Processor? Why Not Snapdragon? Peter Chang: While many bench-marking tests have rated Snapdragon better, these tests are performed by bombarding the processor with loads of tasks and measuring the response time. If we compare individual experiences (such as browsing, games), Intel is better. Q2: Are you planning to expand your service network? Peter: No. This year, we're looking to boost spare part availability. We have service centres in 120 cities and we provide pickup and drop. So coverage is adequate. But repairs get delayed due to spare part non availability- which we will address this year. Q3: What about Asus Watch? To sell smart watches we need strong base of smartphone users. We will think of introducing smart watches once we sell enough number of mobile devices. Few people asked if invitees in the hall will get any preference/discount/priority to buy Zenfone 2- Answer was negative. Few existing customers complained about wi-fi issues and service etc. Asus management accepted that they are new entrants in the market and are contentiously improving. Asus Zenfone 2 is launching nationwide on April 23rd. Pricing and distribution channel details will be known only then. Expecting this device to have a pricing around 20k and will be sold exclusively on flipkart (as per my information). We got a hands on experience with Zenfone 2 that were kept on display. But could only check superficial features and couldn't review in detail. (from the outside, almost all smart phones look the same these days- very difficult to tell the differences, unlike a decade ago, where shape and size used to vary greatly) Event prolonged little later than expected. Had some light snacks and left the venue. Overall the evening helped me catch up with the premium smartphone market and its offerings. Eagerly waiting to get one for myself..
After reading your review, I think this is a nice phone to have. wanted to by a new smartphone. had seen asus zenfone 5. wait for few months for 2. nice info. thanks. Thanks MDS for your comments. Are you looking to buy one?